Munster, Ulster and Leinster have all had slow starts to the season, categorised by poor European performances and results. The appointment of Leo Cullen raised a few eyebrows here. Under his tutelage, the Leinster forwards of last season seemed to be off-kilter, although he somehow dodged the blame for that as Matt O’Connor dug himself an early grave and deflected a lot of the flak with some choice media interviews coupled with a number of poor results. From what we have seen of Leo so far, he doesn’t appear to be capable of igniting a flame under this Leinster team, with their performance against Wasps in the Heineken European Cup a calamity and a farce. It will be very interesting to see how they front up against Toulon in their back-to-back clashes this Christmas. Munster are a particular kind of frustrating. Watching them against Connacht, they appear to be caught between two minds at all times, with nobody making decisions and very little structure around their play. The lack of talent throughout the squad has become even more apparent with the departure of Paulie and the injuries to Peter O’Mahony and Tommy O’Donnell. CJ Stander has been one of the few who has stood up and assumed a leadership role this season, and he will be knocking around the Irish camp come the Six Nations. There are a number of players who need to make the step to the next level, including Dave Foley, James Cronin and Andrew Conway, with Felix Jones’ unfortunate early retirement thrusting him into a starting role at fullback. Jack O’Donoghue is continuing to develop into an important player for Munster, and he got through an enormous workload against Connacht, topping the tackle count with 18 tackles made and none missed, winning one turnover and carrying the ball 9 times, good for second best in that department behind CJ Stander. There was a controversial, and in our view incorrect, penalty try awarded to Munster in the second half. If Conway had caught the ball, he would have been tackled from behind by Muldoon, something the referee failed to grasp as he made his decision. In years gone by, this would have been the tipping point for Munster to assert their control and dominance on the match, to kick on and put Connacht to the sword, but this Connacht team are not like the ones from years gone by. A blending of the youthful exuberance of Robbie Henshaw and Kieran Marmion with the gnarly experience of the likes of John Muldoon and Aly Muldowney has manifested itself beautifully onto the pitch this season. And so it was that Connacht rolled up their sleeves to deliver the hammer-blow to Munster, sealing the game with a cracking finish from Bundee Aki in the corner. After looking back on the tape a few things drew our attention, so let us look at the final score in detail. For starters, Munster have 4 ruck inspectors numbered in this picture. Keatley is the one we should note however, as his late re-alignment causes problems later. In this image, we see Dave Foley (1) who is meandering back into the line with his back turned to the play. With his back turned, he has no idea which way the ball is going. Due to Keatley (no. 2) inspecting the ruck in the previous image, he is slow to get up off the line. As a result, both Chisholm (3) and Earls (4) can’t get up off the line either. 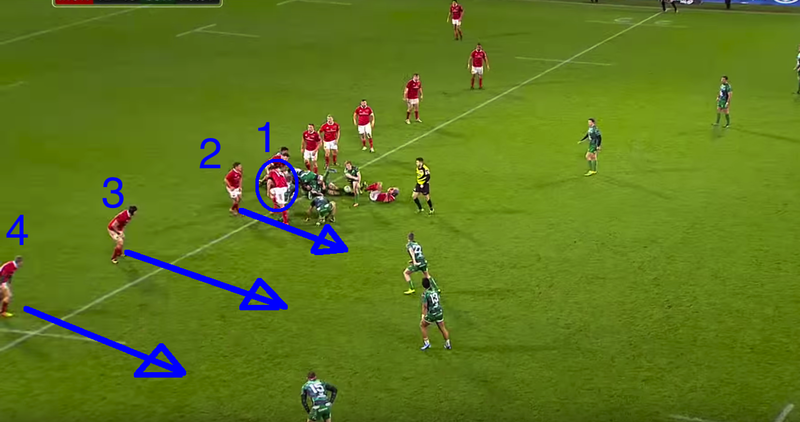 It starts from the inside out in terms of moving forward as a defensive unit to challenge the attackers, so the onus is on Keatley as he is the inside defender. Despite Keatley being out of position initially, Munster still have this under control, with enough men to ably defend this attack. Note that the gap (2) between Earls and Chisholm is only a metre, two at most. All Earls (1) has to do now is keep Henshaw on his outside and use the touchline to his advantage. 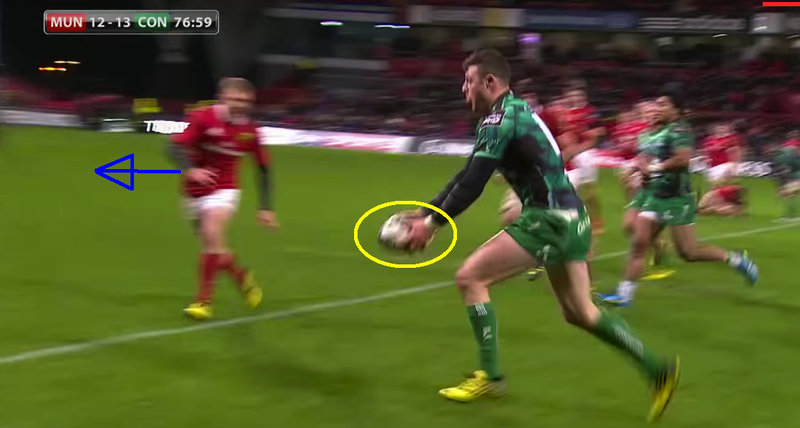 By carrying the ball in two hands, Henshaw has now squared Earls up, fixed him, planted his left foot and exploded into the space. Earls has sunk back onto his heels and Henshaw has him beaten on the inside, a cardinal offence for someone who is playing in the 13 jersey. This lack of awareness, alongside his average distribution and poor tackling technique are reasons why we believe Earls is not an international calibre centre, and is better suited to playing on the wing. With Henshaw tackled from behind by Chisholm, Bundee Aki is presented with two choices. Either Aki will take line A and look for the offload or he will take line B and hit the ruck. Regardless of his decision, Keatley should only have option A on his mind. Denis Hurley and Andrew Conway are in position to deal with a ruck, and the Munster line is trotting back into position. 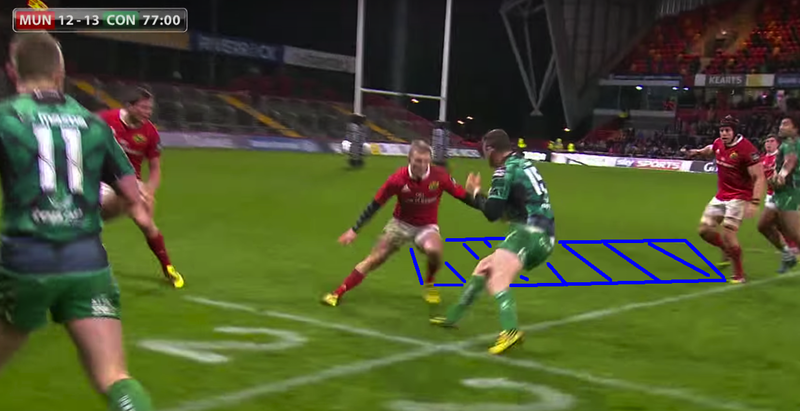 Option A will more than likely result in a try off this phase, so Keatley should be focussing on the worst outcome. 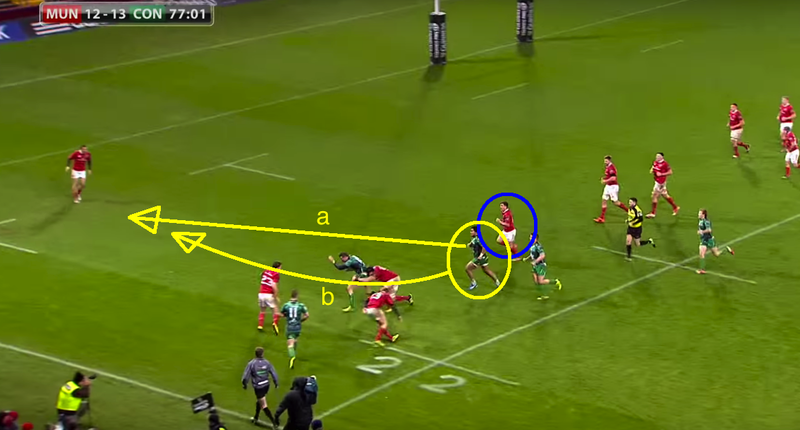 Unfortunately, Keatley didn’t have a Henshaw offload on his mind. From his current position, Bundee Aki (circled in yellow) can not hit the ruck legally, if at all. 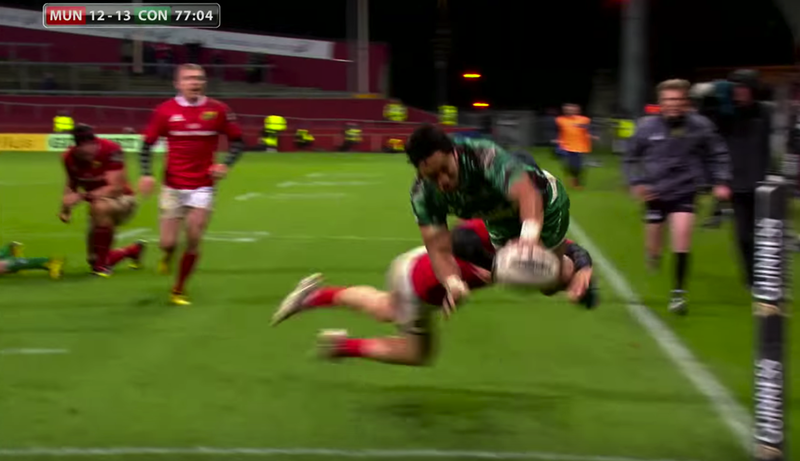 Instead, Henshaw finds him with a fabulous, deft, delayed offload and sends Aki on his way. Aki had some work to do still, even after Henshaw’s pass. What a finish though, diving and keeping his feet off the ground while controlling the ball. Great awareness and athleticism from the New Zealander. He has proven already to be a shrewd acquisition by Pat Lam and the Connacht men. The way Connacht are playing at the moment leads us to believe that Robbie Henshaw would be best served by staying put as opposed to joining a Leinster team in the midst of a mini identity crisis or a Munster team bereft of leadership or even a semblance of a game plan. Unfortunately, it appears as if he will move to Leinster and a Connacht team that is the best in the country at this point in time will lose their best player. Lam has got them playing fabulous rugby, with the skill level throughout the team considerably higher compared with where they were at when he took over. Leinster’s skills have regressed since Joe Schmidt left to take up the national job, and for a player who looks like he will be playing either 12 or 13 for the national team, he would be best advised to stick with the best provincial coach on this island for the time being. The work Pat Lam has done to bring about this change in Connacht’s fortunes has been nothing short of miraculous. Looking at New Zealand, it reminds us of the season the Highlanders had last year, coming from obscurity to relevance in the space of a few seasons. They have made some shrewd acquisitions and are playing with a confidence and a swagger rarely seen before west of the Shannon. Long may it continue, as we are firm believers that four competitive provincial teams will be of more benefit to the national team than only three. Let us see if they can keep this run up over the weeks and months ahead.